So you have an older dog that has been going to the bathroom inside the house and you don’t understand why? Your dog has been successfully house-trained for a long period (over 6 months). Your dog has not aged to the point that the accidents are being caused by incontinence or illness. There. Now that we have those out of the way we’ve established that your dog’s problem is almost certainly a behavioral issue. Our dogs share something like 98% of the DNA with wolves, so from this point on let’s just consider your dog as a wolf who happens to be dressed in cute doggy clothing. The way your dog behaves and acts is by and large still just like a wolf. Your wolf doggy sees themselves as part of a pack, but the bad news is that they’re not seeing you as the leader of that pack. But this can be learned, and there’s a wonderful video series I recommend highly that you can watch here which will teach you how to become the undisputed pack leader. Let me ask you this: if a wolf pup was lost and needed to find their way home how exactly would they go about it? There are no street signs or maps, and wolf puppies have proven themselves time and time again to be haters of GPS systems (if only they’d give them a chance…). What that wolf puppy would do is to pick up the scent of their den and track it back to safety. Adult members of the pack play a role too, as they’re the ones who make sure there’s a nice strong scent to be followed! So, knowing this, what do you think is happening when your dog (that thinks they’re the pack leader) goes to the bathroom inside the house when you leave? They’re doing just what they would do in nature: trying to help you find your way home! And you know what? It worked! You came home! But something’s wrong. You’re stressed, you’re yelling, you’re angry. But that’s natural because you were lost, and it certainly couldn’t have anything to do with that nice new carpet being ruined. Be more consistent with scheduled elimination times. Take your dog outside at the same time every day so he falls into a routine. Take your dog outside more often. If you are only doing it once a day it is not enough. Try increasing your dog’s outside time to see if it helps. Reward your dog for doing his business outside. This helps your dog to associate it with something positive and lets him know that you like this behavoir. Use treats or praise to let your pup know he has done the right thing. Do not yell at your dog when he does go inside. We have written about why you should not yell at your dog before, but all this will do is make your dog afraid of you. In order to help your dog, and put an end to their accidents, you must first think like a dog. You must let them know that you are the one in charge. That you are their pack leader. We’ve written a bit on the subject of becoming your dog’s pack leader here at Dog Training Me, but it’s recommended (and easier) to learn by watching rather than reading. Fortunately, there’s an excellent video series put out by a professional dog trainer and behaviorist named Dan that you can check out here. 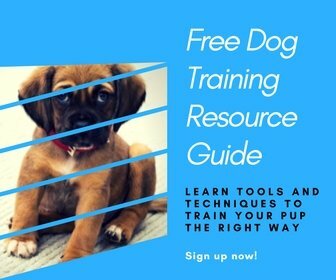 It will go into more detail, and tell you everything you need to know about training your dog. I recommend it highly and hope it will give you the answers that I may not have. Good luck, and I wish you and your dog nothing but the best! P.S. I would LOOOVE it if you could pin or share this article if you found it helpful! Thank you! !